Richard Quinn gave me Xmas work schedules for Crown Lynn that list the major maintenance tasks planned for the Xmas/New Year shutdowns. They record who worked and what work was completed when. In one year there is list of supplies carried on a ship arriving from the UK. This includes glaze ingredients from Blythe Colour Works. There are also chemicals listed from the other British supplier CL used but I can't decipher the writing. By the time I asked him about the other company ischemic brain disease had removed Richard's access to much of his knowledge. I know Blythe had an offshoot based in Melbourne until fairly recently supplying local potters. In The Singapore Free Press and Mercantile Advertiser, 25 April 1940, on p5 there was a brief announcement: "Mr. Cecil George Sergeant, export manager of the Blythe Colour Works, Creswell, Stoke-on-Trent, arrived in Singapore yesterday on his way to Australia, New Zealand and Canada in conection [sic] with export trade." TonyK.,That bag brings back some memories. Blythe Colours were part of the Johnson Mathey group of the UK.The Blythe factory was in Cresswell & supplied among others,the potteries of the Stoke-on-Trent area.They produced glazes,frits,ceramic colour,fluxs & mediums,enamels etc. The factory in Australia was a distribution hub for UK produced colour,mediums etc & manufactured frit & glazes for Australia & NZ. 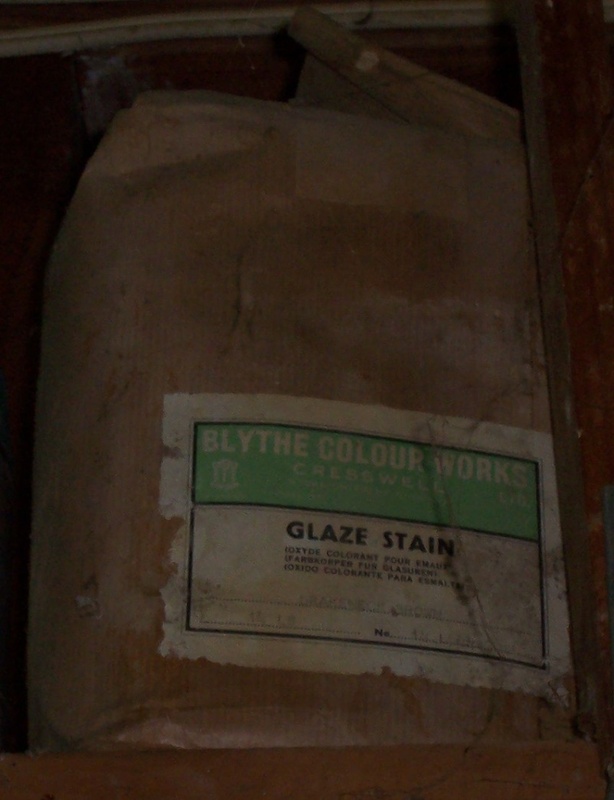 that Tom Clark himself took a dim view of colours being sourced from any other supplier but Blythe.The story goes,that in the early days,Tom went to the UK to buy materials for C.L.The reception he got from, what was then ,the major suppliers,was not helpful. "Keep to producing lamb & leave the pottery to us" is quoted as part of the folklore. He went to Blythe,a company looking to export & forged a relationship that lasted up to Crown Lynn's last days. Thanks rufus - a potter I know here remembers buying ingredients from Bythes in Melbourne and then at some point not being able to any more.